Patrick Hewes Stewart, is an Emmy and Golden Globe-nominated English film, television and stage actor. He is also Chancellor of the University of Huddersfield. Stewart has had a distinguished career in theatre for nearly fifty years, including performances as various characters in Shakespearean productions. 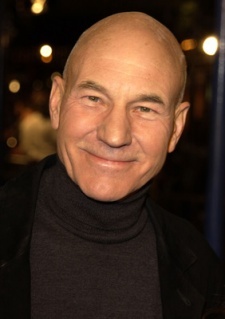 However, he is perhaps most widely known for his roles as Captain Jean-Luc Picard of the starship Enterprise in Star Trek: The Next Generation, and as Professor Xavier in the X-Men films. This is legit a name I did not expect to see here. And the description accurately predicted the two roles I'd know him for. So I get how a Miyakazi film could get this Shakesprean thespian, but how did Steamboy pull it off? Lord Yupa is a master and a gentleman, just like Sir Patrick Stewart. I didn't expect him here.